One of Harvard Medical’s most prescient innovators is challenging old theories about your brain—and spirit. Discover why everyone from global bankers and entrepreneurs to soccer moms are tuning in to his message. After graduating at the top of his class from medical school in South Africa, he received a Medical Research Council Scholarship to study the neurochemistry of panic. Thereafter, he completed his residency in psychiatry at McLean Hospital—Harvard’s largest freestanding psychiatric hospital—with the most accolades ever given to a single resident. Srini also completed fellowships in Psychopharmacology, Structural Brain Imaging and Functional Brain Imaging. He was Director of the Outpatient Anxiety Disorders Program at McLean Hospital and was Director of the Panic Disorders Research Program in the Brain Imaging Center. There, he spent 17 years studying functional brain imaging. During this time, he maintained an active clinical practice, which he continues today. Currently, Srini is a member of the by-invitation-only “Group for Advancement of Psychiatry”, an American professional organization of psychiatrists dedicated to shaping psychiatric thinking, public programs and clinical practice in mental health. The founding group was seeking a way in which American psychiatry could give more forceful leadership, both medically and socially, and as a member of the “Disasters and the World Committee”, Srini’s contributions include but are not limited to two chapters in a book called “Disaster Psychiatry”. Srini is also in multiple collaborations on health-related projects. With Harvard Health, he is developing a model on mindset shifts for burnout. He is also in current collaborations with programmers from Google and MIT to develop technologies that reduce anxiety. In addition to his work in psychiatry, Srini has also consulted regularly for the past 10 years to companies that invest in biotechnology to assess medications in various illnesses including cancer, heart disease, and stroke. Srini has a talent for translating complex research findings in psychiatry for consumption by the general public—in print and through radio, television, and the web. He enlightens and inspires with equal measures of insight, humor, and deep human compassion. Srini prepares and delivers top-rated leadership development courses and plenaries for clients such as: Novartis, Lockheed Martin, Willis Group, Prudential, Pfizer, Fortune 500 Food/Beverage Companies, and some of the largest Fortune 100 consulting firms. He has also trained leaders at The MITRE Corporation, The Department of Defense and The Institute for Law Enforcement with great acclaim. When the UN, World Bank and the International Monetary Fund seek to empower their leaders, they call Srini Pillay. He speaks and teaches throughout the US, Canada, London, Paris, Switzerland, India, Greece and Brazil. Being an internationally recognized expert in applied brain science and human behavior, he addresses both specialists and general audiences on these topics throughout the world. In 2016, Srini was invited by McKinsey & Company to join their new “Consortium for Adult Learning and Development” and also is one of the advisors on a new “think tank” exploring the benefits of mindfulness in business. Srini teaches in Executive Education at Harvard Business School and Duke Corporate Education. He has been an expert guest for CNN, Fox, NPR, The New York Times, Washington Post, Huffington Post, Harvard Business School, Cosmopolitan, Elle, Forbes, Fortune, Business Insider and many other news outlets in a variety of media and is known as a highly entertaining guest. His upcoming book, Tinker, Dabble, Doodle, Try: Unlock the Power of an Unfocused Mind explains how you can harness your mind’s innate tendency to wander, stall, rest, and unfocus and become more productive—in the boardroom, living room, or classroom. It will be published by Random House (Ballantine) in 2017. 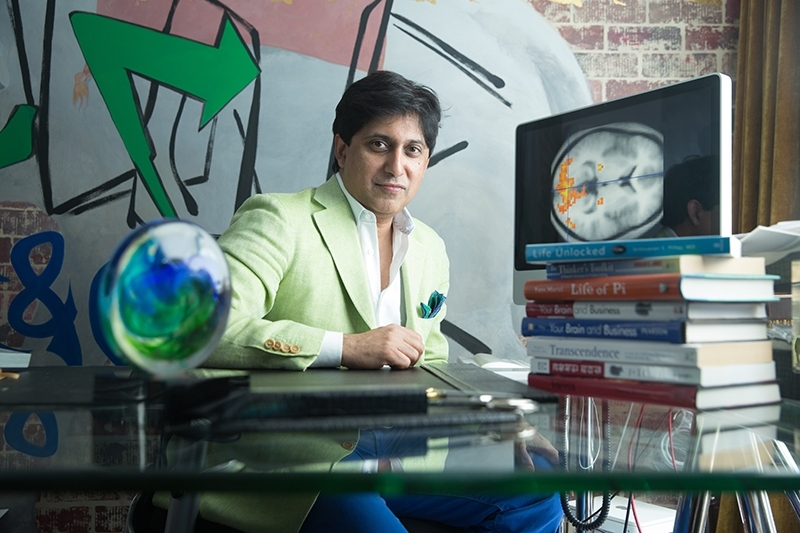 With “renaissance man” bona fides, Srini is an unabashed “dabbler,” a polymath, an accomplished musician, award-winning poet and gourmand who frequently exports insights from neuroscience to other art forms—such as a new program that will combine neuroscience and music for use in corporate development. I found great value in Dr. Pillay’s easy to understand audio materials and benefited from the personalized feedback he provided during a webinar. I sense more calm and concentration in my work habits. I look forward to more progress in my partnership with my brain to tap my personal potential. My go-to expert on fear, grief, and anxiety. Top-of-his-class credentials. A ‘movie-star’ personality who brings a creative spark to every topic. Easily the smartest guy I’ve ever met. We know what we should be doing. Srini helps us see why we’re not doing it—and how to change that. Dr. Srini Pillay continues to have a major positive influence in my life. Just watching his Ted Talk, "Wired for Success: The Science of Possibility" alone inspired me to make a change. He taught me to connect with my intention and vividly imagine my life and my future to become the hero of my own story. Srini’s undisputable love of brain science is obvious. He presents large amounts of complex information in a refreshingly honest and engaging manner. He is one of the most authentic and approachable individuals I’ve ever encountered. Srini’s zest for life and sense of humor are a pleasure to behold. His sense of integrity to others and to his work creates a strong, trusting environment. The richness of information that Srini provides is fascinating to learn, as it is exciting in its application.